It has been about a week and a half since my Laruga Glaser workshops at AYCT and I think the take-aways have really solidified in my practice and in my body. 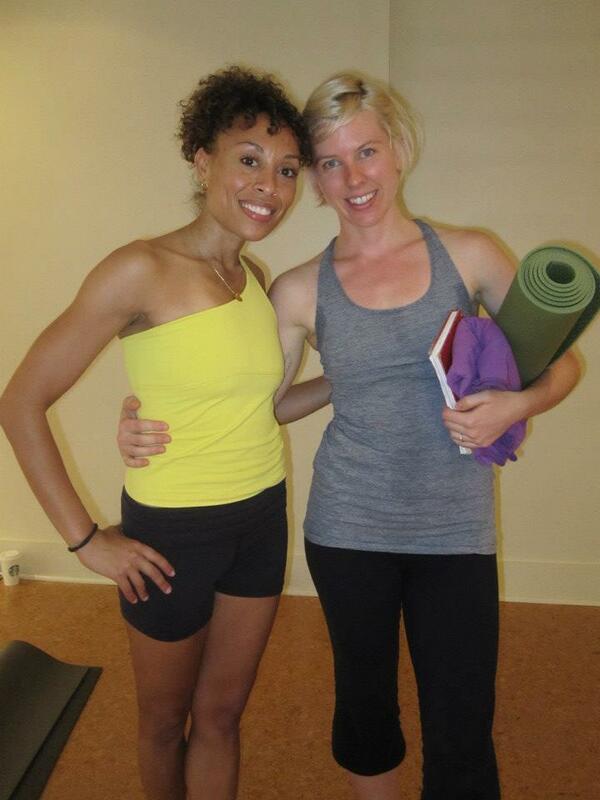 It was truly a fantastic weekend of yoga and if you ever have the chance to study with Laruga, do it. She is much more than just a beautiful practitioner. She is experienced and knowledgeable, and has had her own challenges with the practice, which I always find comforting. She speaks a language I understand, if that makes any sense. I always got what she was saying and could at least try to apply it. The three workshops I took with her were intermediate series, arm balancing, and back bending. It was incredibly fun! I got to have my mat (at the very front, of course) between my favorite yoga pal, my sister-in-law, and a lovely fellow AYO yogi. We worked hard, but we also played, we laughed, and we generally brought the lightness that ashtanga can occasionally lack. I will try to outline some of the stuff that really spoke to me and that I’ve brought to my own daily practice. *In pasasana it is ok if the knees and feet aren’t even as you work to get the heels down. I may never get my heels to the floor because I have very tight achilles, but it is much easier for me to find a nice stretch and get closer if I’m not stressing about staying totally aligned through the legs. It helps the balance. She also says to stay low, do not life the hips too much to try to get the heels to touch. Use the wrapping arm to pull the top shoulder back, opening up the chest more and deepening the twist. You know these already? Well, I didn’t and they’ve been mega helpful in practice this week. *Jump directly into krounchasana with the lifting leg straight. As you come to seated, use the back of the hand on the foot to stabilize and help you lift the leg the rest of the way into position. You might be shocked that I wasn’t always doing this, because it is correct vinyasa, but we all have our lazy habits and one of mine was to jump into triang mukha, then bend the leg, take the foot, then lift to the full position. No benefit. I’ve been doing it correctly since Sunday practice, and I surprised myself that I actually do have the strength. It’s silly how we limit ourselves. * In bhekasana, Laruga makes a “barbie foot” by pressing into the ball of the foot and flexing the toes. She says this helps keep the ankle strong and aligned. It also conveniently helps keep the hands in place when you’re super sweaty, as I am by this point in my mega-long practice. I asked about knee alignment. Laruga says that the knees should stay on the ground rather than lifting, if possible, but that it is totally ok for the knees to splay out. Just let them go where they feel comfortable. *Laruga regularly talks about treating the body as one whole unit and the importance of getting to the posture in the simplest way possible. This comes into play in places like bhekasana, where you should grab for both feet at once, then turn both hands at once. I have been trying hard to always think of this since and have noticed the places where I was taking extra steps (dhanurasana, for example, grabbing for one foot at a time). It is always one breath, one movement, not one breath, three movements or whatever. Always a good thing to remember, we can all get lazy or sloppy in our vinyasas. *In dhanurasana, keep the inside of the foot together, knees can come apart. I had been told toes and heels together, which seems like a small difference but it has really changed the way I approach the pose and my leg alignment. I had also been told knees come together, but Laruga says knees can go wherever is comfortable. *In arm balances we worked on bhujapidasana, a pose that is fairly difficult in primary. I have never really understood how to go chin to the floor rather than forehead. Laruga explained that you look forward, chest proud as you lower. What a small point, but I had never had it explained to me in that simple way. Another huge difference. We also worked on the transition back to bakasana and I realized mine was so awkward because I wasn’t allowing myself to tip forward enough to bring the hips high. Lightbulb moment # 100 for the weekend! *In urdhva dhanurasana, Laruga has her students get hands and feet in position, raise the hips, come to the top of the head, then “plug in” the shoulder before lifting up. The arm comes back fully into the socket before the press up. It feels great. She applies the same principle in kapotasana, which has helped me to eliminate whatever was causing the pain in my left shoulder when I tried to walk my hands back. *Lots of talk about tailbone pointing down rather than scooping in any of the front body streching poses. This was a new experience for my lower back. The scooping I was desperately trying to accomplish was creating tension, especially in my glutes, which I was trying to fight. This lengthening is creating space. Something I’ve probably been told before but have only just gotten a handle on. *In drop backs, Laruga challenged us to drop back with hands over head and to work towards doing it on the breath (exhale down, inhale up, exhale back down, inhale up, etc). So fun! I’ve been trying to do it on the breath somewhat this week and it has been great. For me, workshops are money well spent. A fresh perspective and a new way of explaining the poses are invaluable. I always feel that I come away with something meaty (pardon the phrase, my vegan friends). This weekend, I felt like I got more than just one or two things, I got a lot. It was extremely worthwhile and really refreshed and re-motivated my practice.